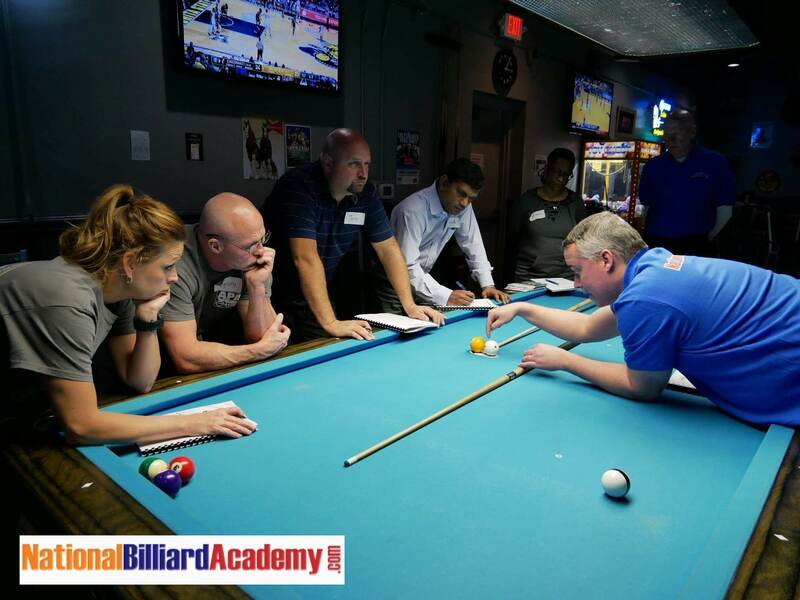 Covering two very full days, Saturday – Sunday, pool school is hands-on. To really improve, you have to spend time at the table, trying what we’re working on. 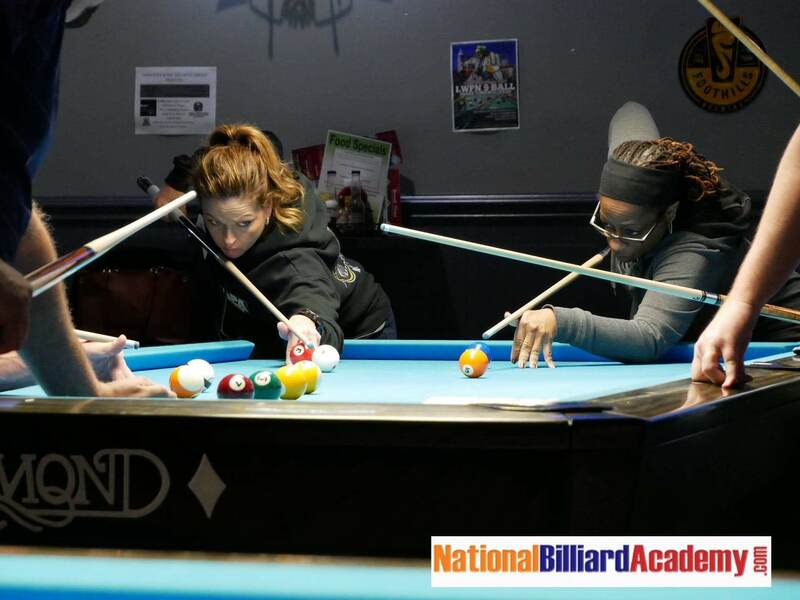 Pool school is not competitive, it is designed to meet needs of players at ALL SKILL LEVELS. Each student has their own table for the weekend; receiving personalized instruction to improve YOUR game in a way that works for you. In addition to instructor demonstration & group discussion, our highly experienced staff provide coaching at your table, ensuring each student gets plenty of one-on-one instruction. Smaller class sizes (typically 8-12) to provide each student a lot of one-on-one. Raise YOUR GAME- register NOW! 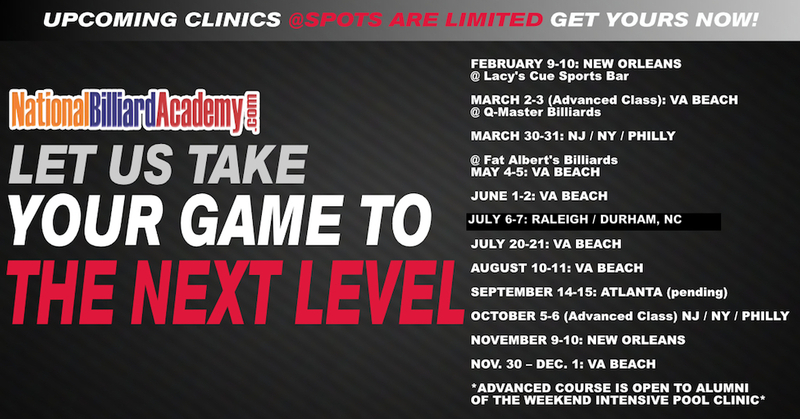 MARCH 30-31: NJ / NY / PHILLY – 1 SPOT LEFT! Call or email for pool room locations, costs, or to discuss your particular needs or concerns. The Weekend Intensive is designed for players of ALL skill levels. Most pool players are stuck at some level because their fundamentals are not strong enough to allow them to progress. The NBA focuses on developing & maintaining a solid foundation of good fundamentals. If you can’t make the cueball go where you want, advanced knowledge & techniques are of little value. positively transform the way you see the game, ball pocketing will no longer be an issue, putting it all together, giving you an improved, stronger game – permanently. Most players come out of the Weekend Intensive with enough to work on to make progress on their own for several years. Note: The Intensive class structure and content is the same at all locations. Phone or email to get the current schedule & pricing. Register for the city/dates you want or request to be notified of upcoming dates and locations. There is an enormous need for good instructors, and it’s very gratifying to see players improve. Teaching also raises your own game. All PBIA & ACS Instructor credentials are available through this school, at all locations. The NBA has certified hundreds of instructors. Call or email for details.